I’ll admit it: I’m a total foodie! 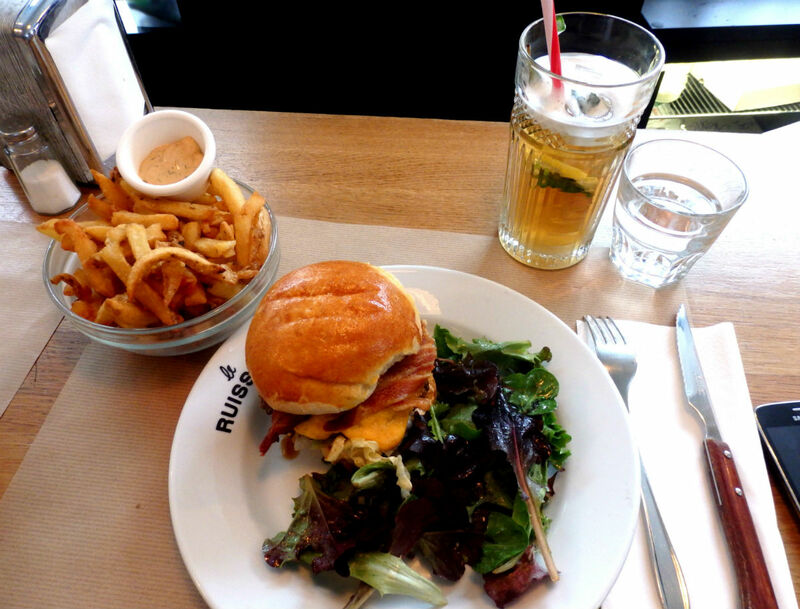 Discovering new restaurants in Paris is a thrill for me, I spend hours scrolling through Instagram looking at pictures of food and noting down the restaurants I must try next, I love avocado toast and bubble tea (this is purely FYI), I know that one of the reasons I have no savings is that I eat out far too often, when I travel to a new destination I strive to research in advance the local restaurant scene so that I don’t waste time in a tourist trap (nothing upsets me more), and I am extremely happy when eating an amazing meal (preferably with friends who are equally pleased). A delicious « citronnade » éclair from L’Atelier de l’éclair: It was hard to choose an éclair from the pastry rainbow in their display case but I definitely made the right choice. The lemon and lime cream inside the choux pastry tasted like key lime pie filling (which I looooove) and it was topped with a sweet lemon glaze, lime zest, and the cutest little meringues. All of their éclairs (4, 90 Euros each) are works of art and I will definitely be back to try others. Beaufort cheese tasting at La COOP: The Beaufort cooperative has several stores in France but only one location in Paris. This store sells various products from the Savoy region but specializes in Beaufort, the cheese made from the unpasteurized milk of cows that graze in the French Alps. Sound delicious? 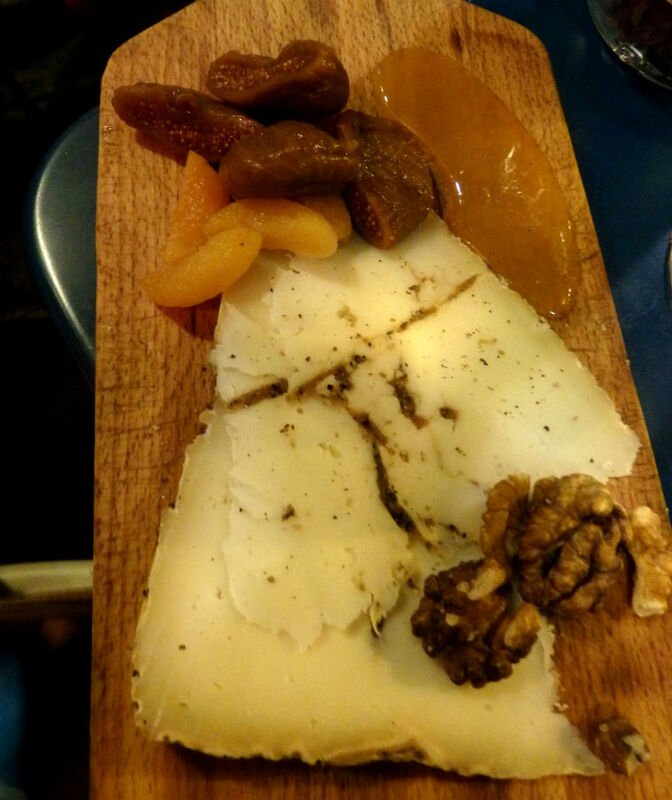 Well it is, and I got to try two types of this popular cheese: Beaufort d’été (summer), with a lighter more floral taste, and Beaufort d’hiver (winter), that was slightly stronger than the summer version. We sat down at one of their tables and ordered a glass of Chablis to wash down the generous serving of cheese that was offered by the lovely ladies of this shop. 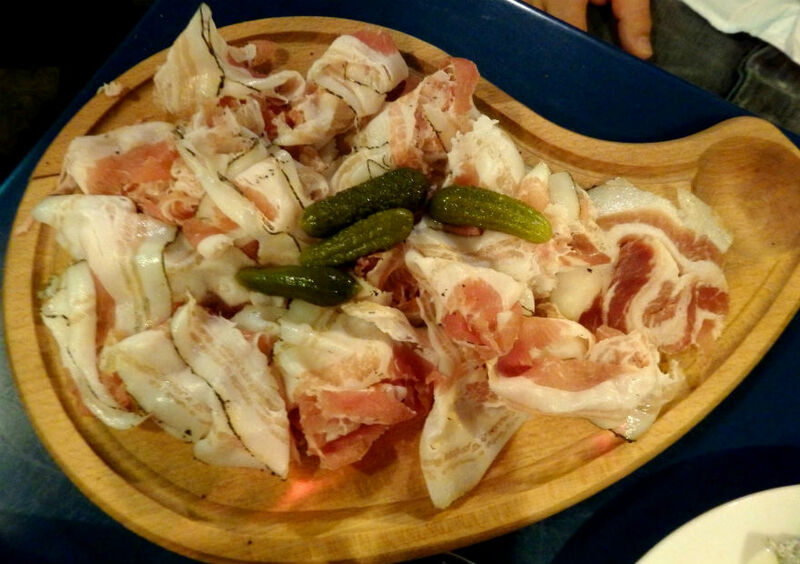 Cured meat from A la main: This food store specializes in products from Corsica! One of the owners carefully sliced me some Corsican sausage made from Corsican black pig meat and it was delicious, with a slight peppery taste and a little stronger than a regular saucisson. I looked around their boutique and ended up buying a jar of Corsican beefsteak tomato ketchup: it tastes like a mix between regular ketchup and a tomato chutney. I’m sure that all of their products are amazing! A slice of Comté cheese on toast from L’affineur Affiné: This cheese shop is different from most as it has a seating area at the back which offers customers the chance to sit down and enjoy a selection of their cheeses (and yes, they have a nice wine list too) in addition to other freshly prepared dishes. The owners are very knowledgeable and can explain the difference between a Comté and a Beaufort. 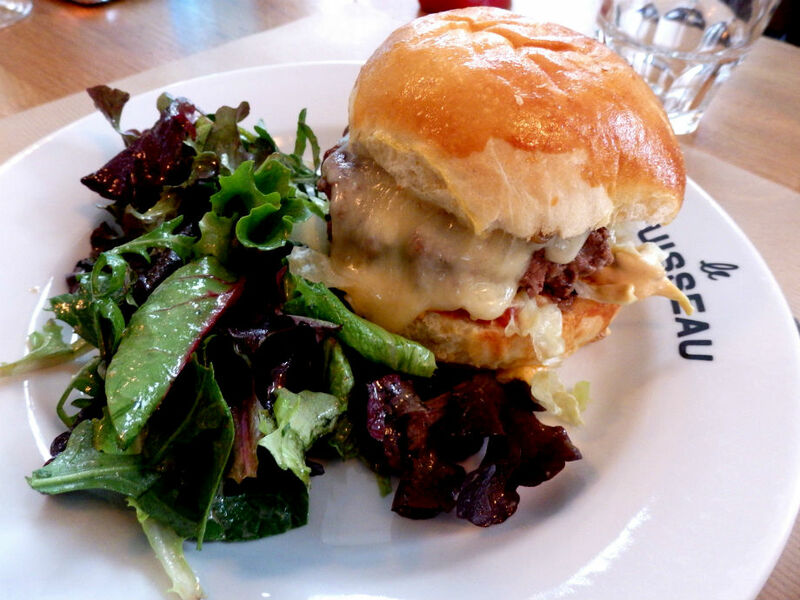 They even offer a cheese-filled brunch on Sundays. This place is truly a cheese lover’s paradise! 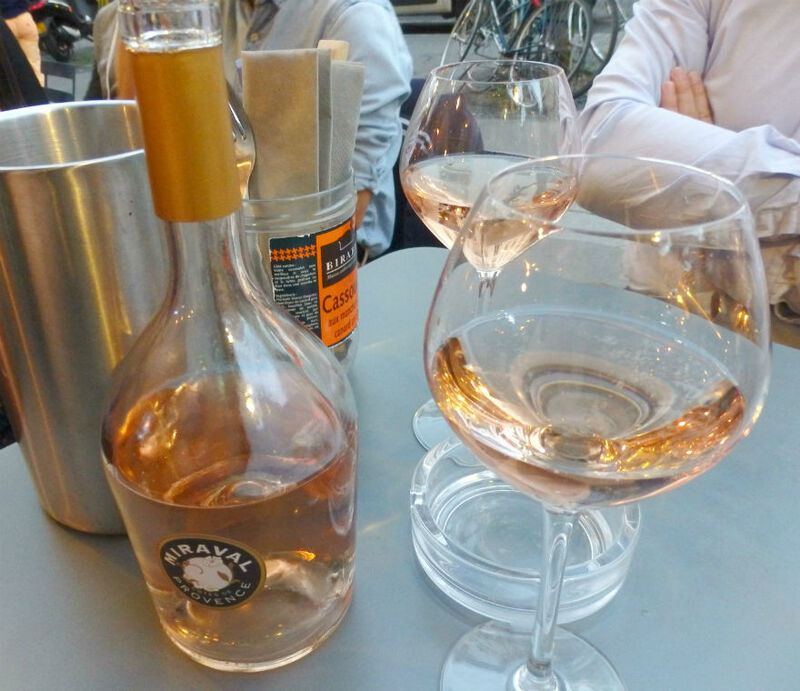 A glass of white wine from Les Petits Domaines: It wouldn’t be a Parisian food tour without a glass of wine! 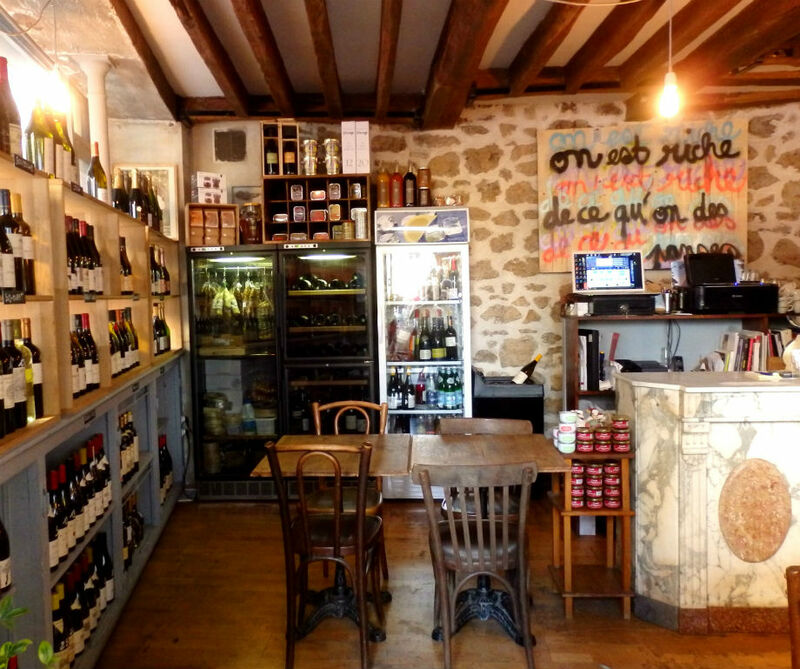 This little cave à vin (wine store) has a great selection of French wines (for all budgets). 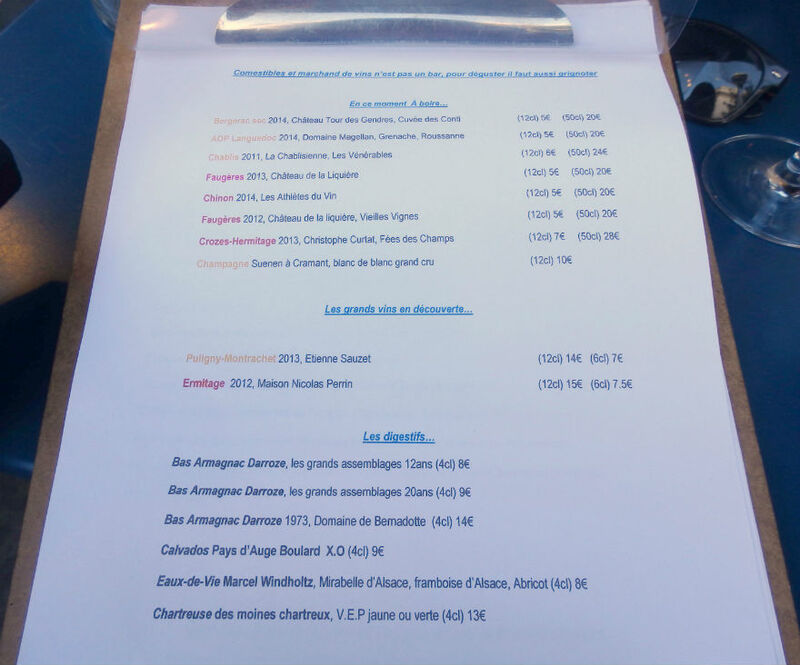 Isabelle, the owner, who just celebrated Les Petits Domaine’s third anniversary knows all about the wines in her boutique as she carefully selects wines from small winegrowers and visits vineyards regularly in order to find only the best. I tried a nice glass of white wine from Provence that was dry (I can’t stand sweet wines) but with a lovely floral undertone. 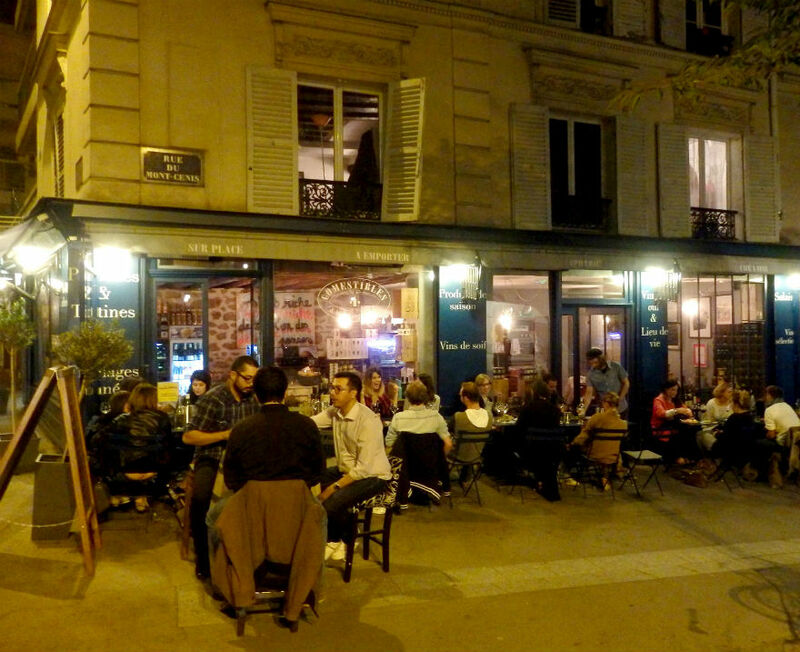 This is a great place to pick up a bottle for a picnic at Champs de Mars (literally only 200 meters away) or to participate in a wine tasting session (offered on Saturdays). A filled waffle from Méert: So this was one of the stops that I was already familiar with, but it’s hard not to have heard of this famous chocolate, sweets and pastry house known for its waffles. The beginnings of Méert go back to 1677 in Lille but their thin waffles, filled with a generous amount of vanilla cream frosting are still famous today. A little too sweet for my liking but I brought my boyfriend along, who loves filled waffles, and let him enjoy one of his favorite treats. Chocolate sampling at Ara chocolat: One of the most interesting stops on my journey was this tiny chocolate shop that sells authentic organic chocolate. The owners are very knowledgeable (I was given a detailed explanation of the entire chocolate making process) and they make their chocolate bars on the premises using cocoa beans from various places such as Costa-Rica, Peru and Belize. You can smell the chocolate as soon as you walk through the door and it was pretty fun getting to try the various chocolates, all of which had distinct flavors. Three samples of iced tea from Kodama. I love tea (I have to say I drink much more tea than I do coffee) so this little tea shop definitely won me over. The two owners create their own mixtures of teas with various fruits and spices and as it was a hot day I was offered three samples of iced teas. My favorite was “poids plume”, an organic mix of Sencha green tea, basil and citrus fruits. No sugar is added and no sugar is needed. Their iced teas are perfectly balanced and so incredibly refreshing on a hot day. 3 Mini cookies from Jean Hwang Carrant: Jean is an American expat who started her cookie shop when she couldn’t find any good cookies in Paris. Her cookies are delicious and very creative, with flavors including matcha with white chocolate, black sesame, and nutella. I have to say that she is also one of the friendliest people that I met on the food tour and she was kind enough to give me 5 mini cookies (thank you Jean :)) instead of 3! A mojito macaron from Les Artizans: After seeing the usual suspects I opted for the most original macaron on the menu with its lime and mint flavor giving it the taste of a mojito. In addition to their macarons they also have a beautiful selection of French pastries and are equally a bistro serving carefully prepared French dishes. A great place for lunch! A little pot of jam from La chambre aux confitures: I chose their raspberry champagne jam after browsing through their huge selection of jams and sampling quite a few. 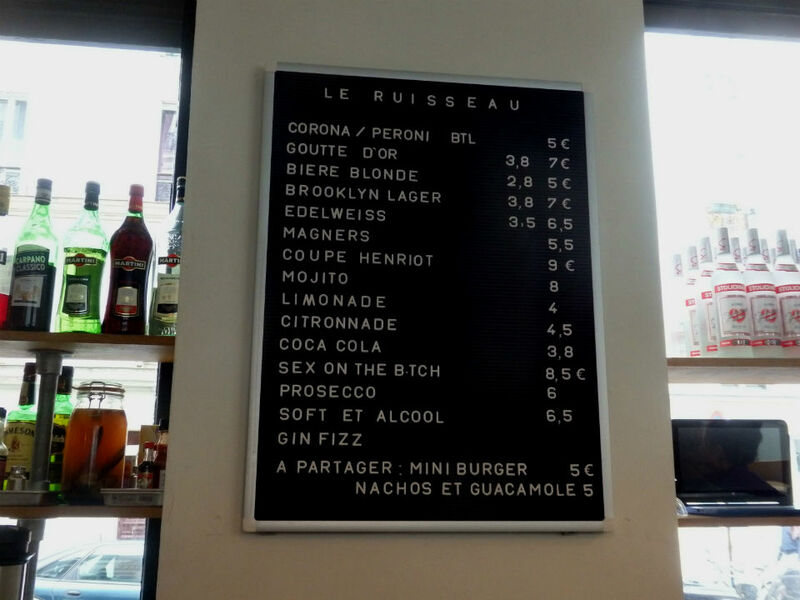 It was very hard to choose as they have all the classics (i.e. strawberry, apricot, and fig) in addition to more creative concoctions such as a mix of banana, rhubarb and passion fruit. 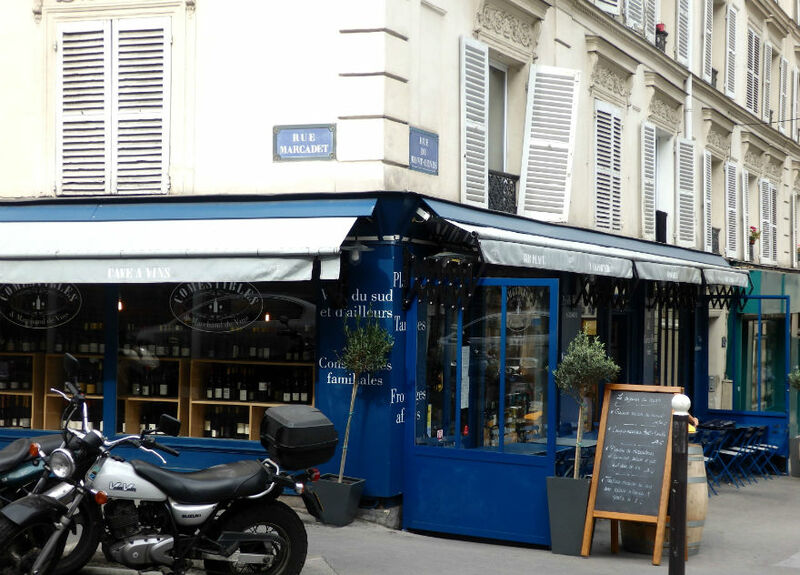 While they have several locations in Paris (and in other French cities), their jams, chutneys and honeys are all made in France and therefore make great gifts. A mini chocolate cake from l’Épicerie Fine Rive Gauche: This little specialty food store can be found just off of rue Cler and is packed with various foodie treats such as sardines, patés, mustards… AND fondant baulois: a chocolate fondant cake originally from La Baule (a posh coastal town near Nantes). There was only the gluten-free version left (made with rice flour) but this compact and moist chocolate cake was delightful and a great way to end my food tour! 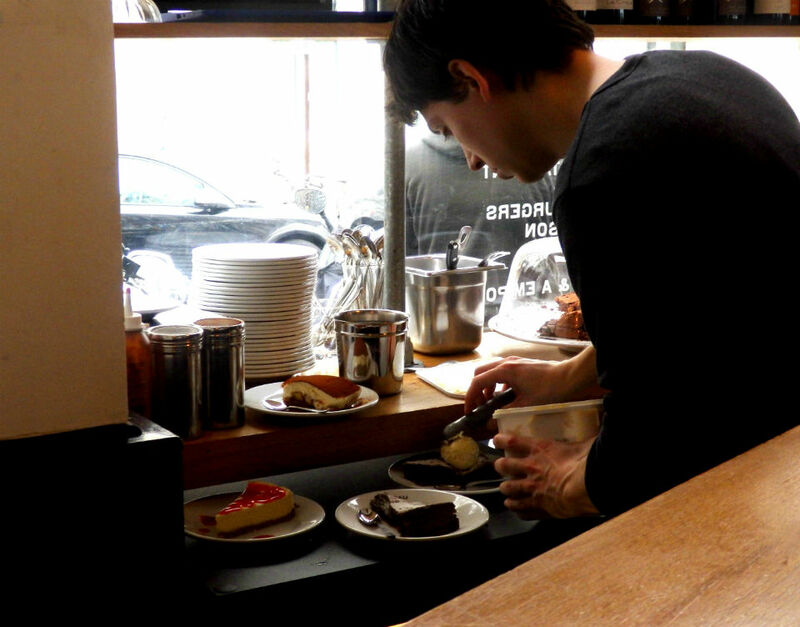 What’s best about the Food Passport (apart from all the free food)? 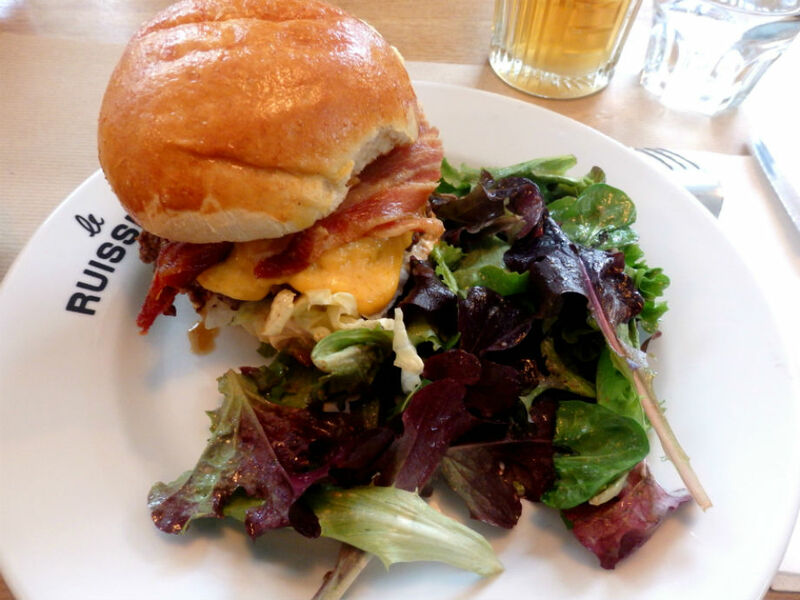 You get to discover some amazing foodie spots in the city while learning some fun foodie trivia (i.e. how the éclair got its name) and meeting the passionate people that sell the delicious food you are eating. Apart from two or three places that I was already familiar with, the rest were great discoveries. I also hope to visit the places that were equally listed in the passport but that I didn’t get to (it’s nothing personal, it was just so hard to pick only 12). It is, without doubt, the perfect gift for a foodie like myself. It is also a unique way to take a tour of the city. 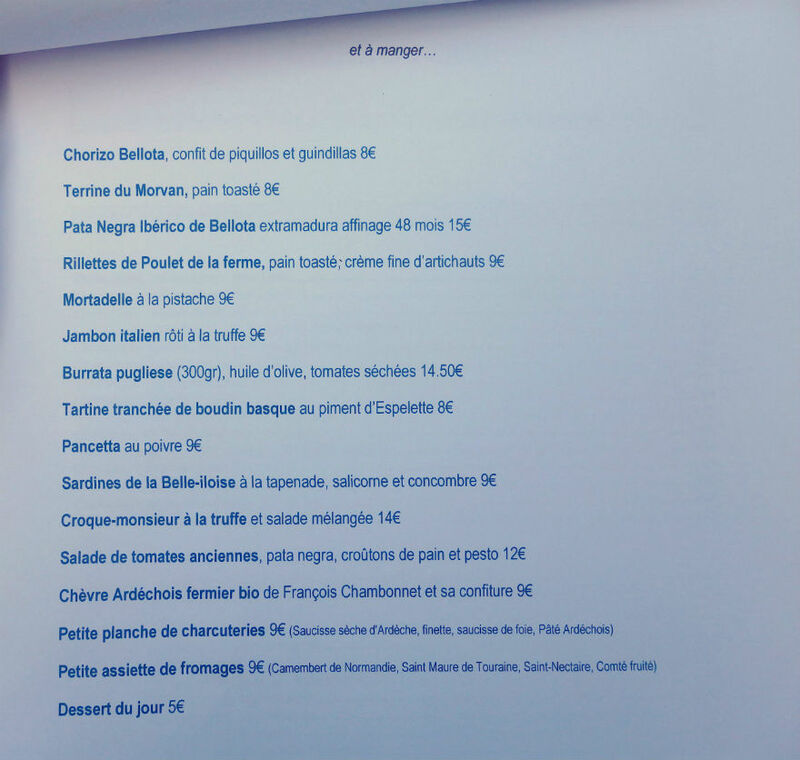 So, if you (or a friend) are thinking of coming to Paris (or Lyon) anytime soon, make sure to order your very own Food Passport! 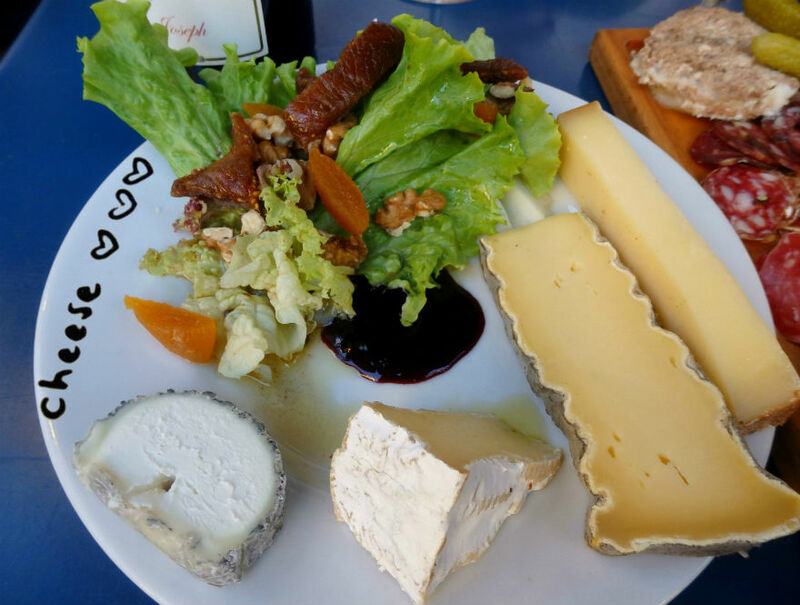 Categories: Uncategorized | Tags: authentic, cheese, discover, food tour, foodies, french food, gifts, Paris, paris foodies, paris restaurants, real paris, tourism, tours, Travel, wine | Permalink. 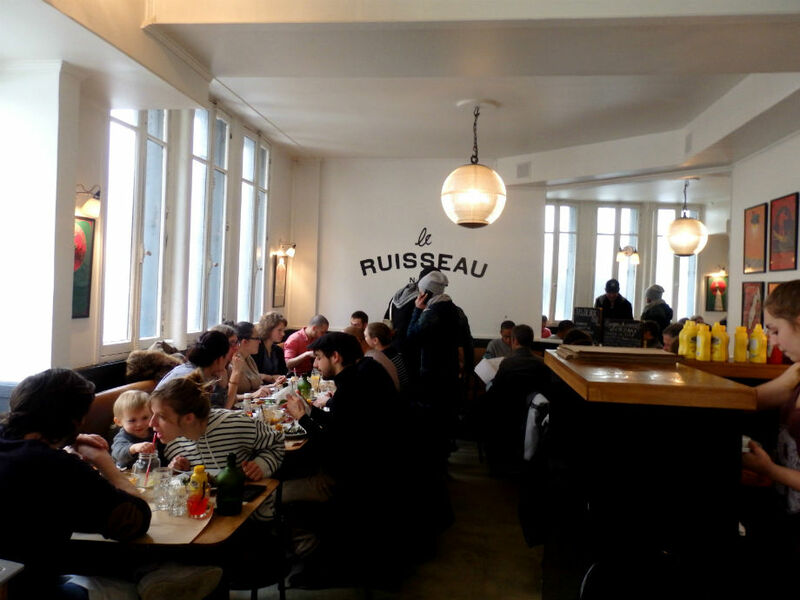 Although I live close by, I had not heard about the burger joint, Le Ruisseau, until I saw that it had been voted as Timeout’s best café/restaurant in the 18th arrondissement. 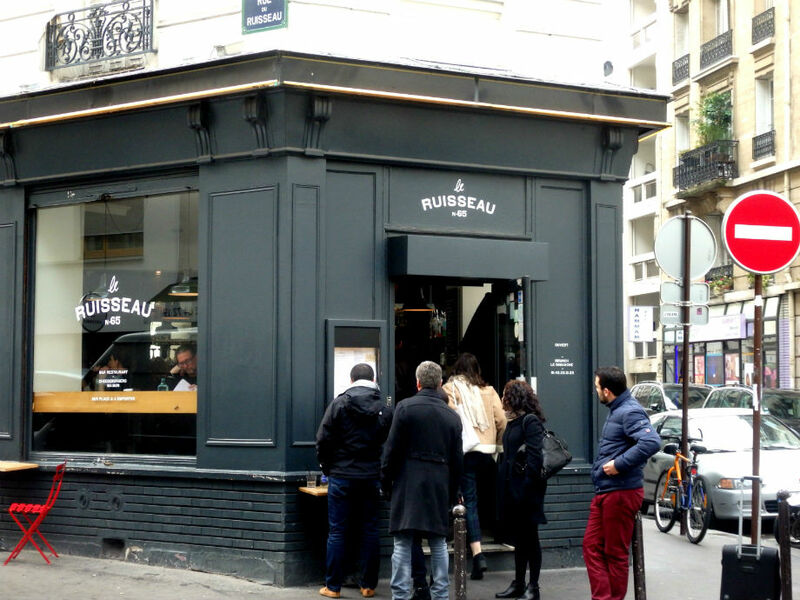 At first I was embarrassed by the fact that I did not know of its existence, but then I quickly realized that I can’t know every restaurant in Paris and decided to get there as quickly as possible. My expectations were pretty high and I was worried that I would be disappointed, but I am happy to report that I, like many others, am now a huge fan of the place! 5 bottles of American mustard out of 5! 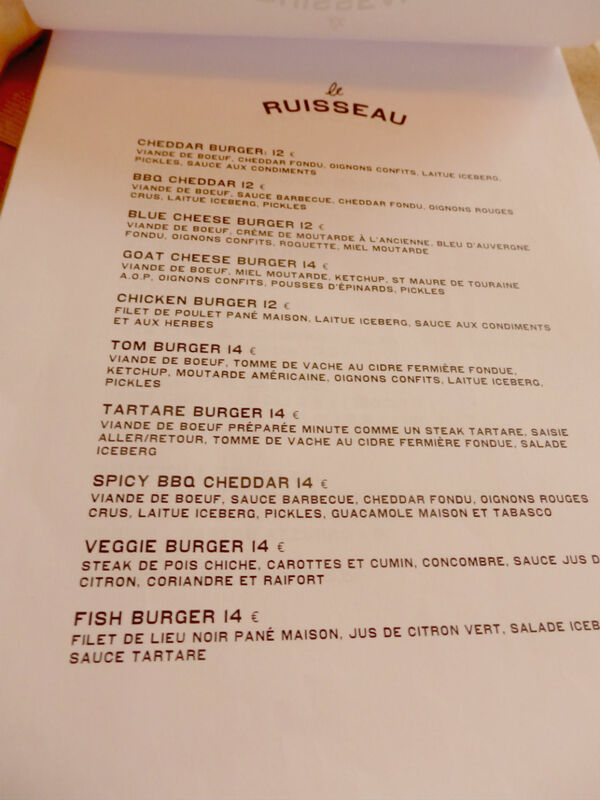 Categories: Uncategorized | Tags: beef, burgers, cheese, cocktails, comfort food, foodies, fries, Paris, paris restaurants, Travel | Permalink. 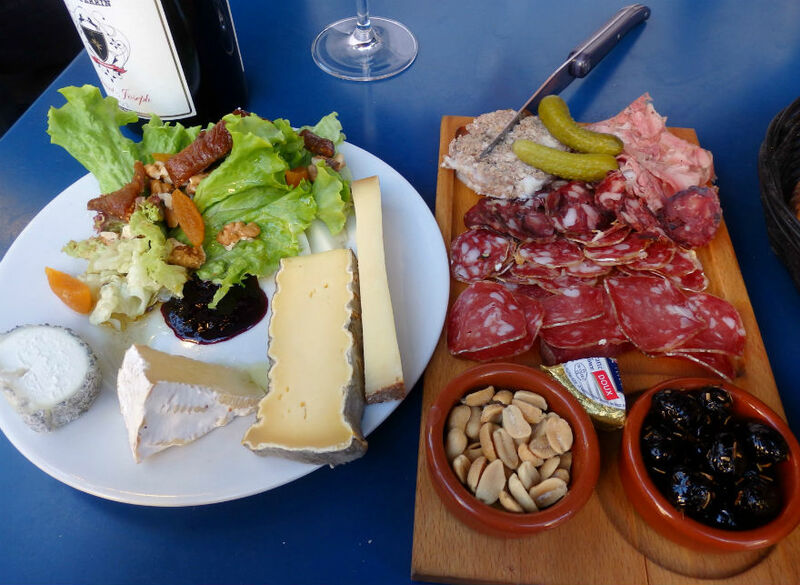 Categories: Uncategorized | Tags: charcuterie, cheese, comfort food, Paris, wine | Permalink.